Report on a plesiosaur skeleton from Western Kansas. 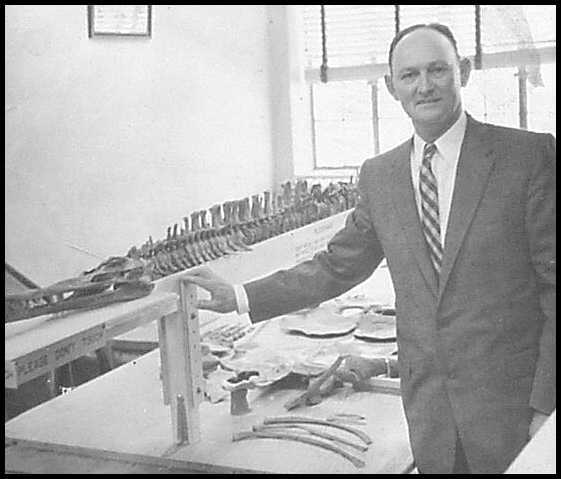 LEFT: Marion Bonner stands beside his partially mounted skeleton of Dolichorhynchops osborni in the Sternberg Museum of Natural History (about 1956). Wherein Sternberg and Walker report the discovery of only the third nearly complete Dolichorhynchops osborni (not Trinacromerum) from the Smoky Hill Chalk. All have come from the upper chalk of Logan County. The Fort Hays Kansas State College Museum has recently received an important specimen for its Division of Paleontology. This latest accession consists of an unusually complete skeleton of one of the smaller plesiosaurs of the Kansas Niobrara Cretaceous. A preliminary study indicates that it is closely related to those forms known in the scientific literature as Trinacromerum of the family Polycotylidae. This very fortunate discovery was made by Mr. M. C. Bonner of Leoti, Kansas, and he has kindly presented it to the museum. The specimen was collected from a small exposure of Niobrara Cretaceous a few miles southwest of Russell Springs, Kansas. The nearly complete skeleton, although somewhat disarticulated, was imbedded in the bluish chalky-shale member which lies below the reddish-buff chalk in this area. Fossil vertebrates found in this chalky shale member are usually well replaced and excellently preserved. This individual is certainly no exception, for the bone is very hard and dense. This condition greatly facilitated preparation of the specimen, and should make possible careful and detailed study of the skull, lower jaws and all other portions of the skeleton. The general form and size of the skull and lower jaws is similar to previously described specimens of Trinacromerum; however, there are some differences in the length of the tooth-bearing surfaces of the premaxillae and dentary .The suture lines of the skull, as well as other skeletal features, indicate that the specimen was a fully mature individual. The vertebral column appears to be nearly complete, and a majority of the vertebrae are free from crushing or distortion. They are typically plesiosaurian in structure with conspicuously concave centra and well- developed spinous processes and articulations. The atlas-axis and all cervicals are present; possibly one or two dorsals are either absent or reduced in this specimen, and perhaps two to five terminal caudals may be missing. For the most part, the vertebrae and articulating surfaces and processes are well preserved. Several complete ribs are present, plus a number of incomplete and fragmentary rib sections. Transactions of the Kansas Academy of Science, Vol. 60, No.1, 1957.
exhibits strong and conspicuously developed articulating surfaces and rugosities for muscle attachments. These articulating surfaces and rugosities appear more pronounced than in any other plesiosaurian genus thus far described in the literature. The fossil bone is very heavy and dense, and may be indicative of certain skeletal adaptations in these highly specialized aquatic reptiles of the upper Cretaceous. Only the left forelimb is present, and the distal elements of all phalanges are missing. The humerus, like the femur, is well preserved and exhibits strong and conspicuously developed articulating surfaces and rugosities for muscle attachments. The most interesting and diagnostic parts of this plesiosaurian skeleton are the pectoral and pelvic girdles, and fortunately both are complete in this specimen. The pectoral girdle is composed of the clavicle, interclavicle, scapula, and the greatly enlarged and specialized coracoid. The size and development of the coracoid is especially significant in this skeleton, exceeding considerably the coracoid of previously described specimens. In the pelvic girdle the pubis and ilium are present and complete, but the distal portions of both the right and left ischium are missing. Measurements of these elements, like those in the pectoral girdle, appear to exceed those of previously described species of Trinacromerum. The overall length of this skeleton, from the tip of the premaxillae to the last caudal vertebra, is slightly more than 10 feet, while the greatest breadth, due to the expanded coracoids, exceeds 30 inches. The depth, measured from the tip of the longest neural process, along the curved ribs to the coracoid floor, is approximately 30 inches. Prior to the discovery of this latest specimen of the small Cretaceous plesiosaur, only two complete skeletons were known to science. The first was discovered in 1900 by Mr. George F. Sternberg and is now in the Museum of Natural History at the University of Kansas. The only other known specimen with nearly complete skeleton was also found by Mr. Sternberg. It was collected in 1926 and is now in the Harvard Museum. No attempt is being made at this time to assign this latest accession to any previously described genus or species of plesiosaur. A detailed description of the skeleton, supplemented by photographs, illustrations and measurements, is planned for the near future. The nearly complete specimen (FHSM VP 404) described above is shown here. It was found in Logan County by Marion Bonner in October, 1955, and is currently on display in the Sternberg Museum. View from the left side is HERE. The specimen was described by Marion Bonner's son, Orville, in his 1964 Masters thesis. The skull of Dolichorhynchops osborni is long and narrow. It is also lightly constructed and is almost always found severely crushed. The skull of this specimen in the Sternberg Museum is about 16 inches long (51.3 cm), and probably came from a fairly young individual. Adams, D. A., 1997. Trinacromerum bonneri, new species, last and fastest pliosaur of the Western Interior Seaway. Texas Journal of Science, 49(3):179-198. Bonner, O. W., 1964. An osteological study of Nyctosaurus and Trinacromerum with a description of a new species of Nyctosaurus, Unpub. Masters Thesis, Fort Hays State University, 63 pages. Carpenter, K., 1996. A Review of short-necked plesiosaurs from the Cretaceous of the western interior, North America, Neues Jahrbuch für Geologie und Paläeontologie Abhandlungen, (Stuttgart) 201(2):259-287. Carpenter, K., 1997. Comparative cranial anatomy of two North American Cretaceous plesiosaurs, pp. 191-216, In Calloway, J. M. and E. L. Nicholls, (eds. ), Ancient Marine Reptiles, Academic Press. Sternberg, G. F. and M. V. Walker, 1957. Report on a plesiosaur skeleton from western Kansas, Kansas Academy of Science, Transactions, 60(1):86-87. Williston, S. W., 1902. Restoration of Dolichorhynchops osborni, a new Cretaceous plesiosaur. Kansas University Science Bulletin, 1(9):241-244, 1 plate. Williston, S. W., 1903. North American plesiosaurs, Field Columbian Museum, Pub. 73, Geological Series, 2(1):1-79, 29 plates. Williston, S. W., 1908. North American plesiosaurs: Trinacromerum. Journal of Geology 16:715-735. figs. 1-15. Williston, S. W., 1914. Water reptiles of the past and present. Chicago Univ. Press. 251 pp.